To start, you will need a piece of Distress Watercolor paper. The pack comes with twenty - 4 1/4 x 5 1/2" pieces which will work for our leaf. Cut the watercolor paper to 4 x 5 1/2". I am using Distress Stain to color the Watercolor cardstock - Gathered Twigs, Crushed Olive, Ripe Persimmon, and Evergreen bough. Just a little of each onto the Craft Sheet. Remember, the colors are next to each other on the Craft Sheet, not on top of each other. 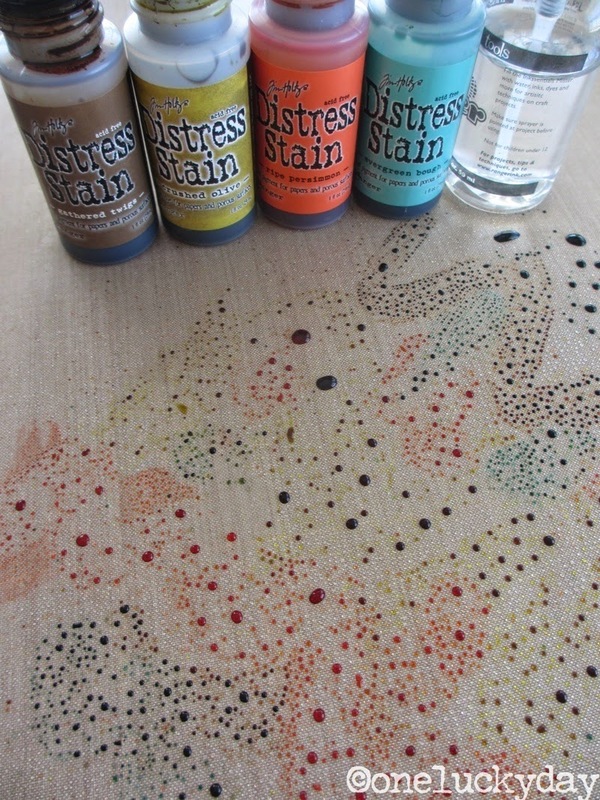 Spray stain with water. Smoosh (is that a real word?) the card down into the stain and pick it right back up again. Move to a paper towel to dry. The card does not have to be completely dry before you go back into the stain gathering small droplets. 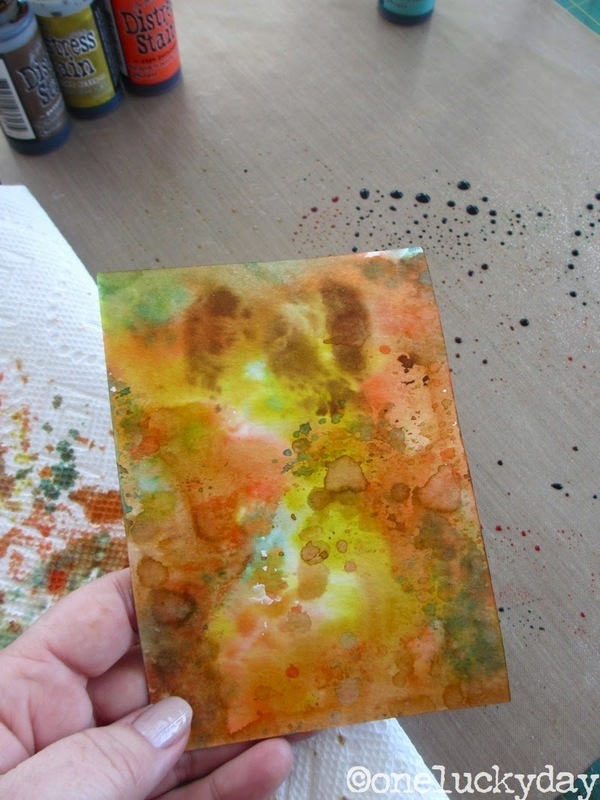 Repeat 4 or 5 times until the card has layers of color, then dry completely. Once it is dry, run the card through the Vagabond/Big Shot machine to die cut the Layered Leaf shape. It really is beautiful with all the different layered colors of Distress Stain. That little hint of Evergreen bough is my favorite part. So I bet you're thinking, what she gonna do with that leaf? the leftover shape or negative image or the leaf. So I set the leaf aside for another day and went to work on the idea in my head (I get those every once in a while). I cut a piece of Specialty Stamping paper 4 1/4 x 5 3/4" and centered it in the Texture Fade that comes with the Layered Leaf set. 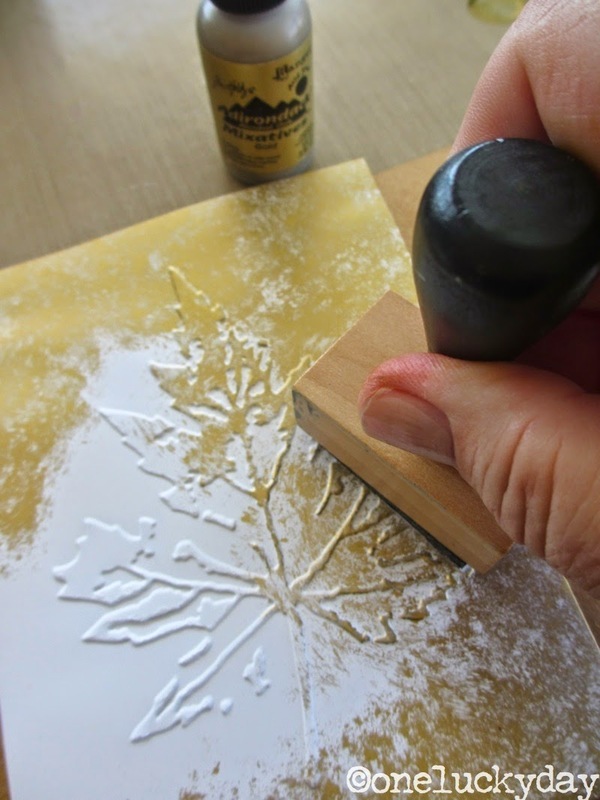 Note: I used 12 x 12" Specialty Stamping Paper to cut my own paper, as the pre-cut sheets are only 4 1/4 x 5 1/2". Yep, only 1/8" shy of what I wanted. Yes, I probably could have adapted the idea if I only owned the smaller size, but since I had one package of the 12 x 12" I used it and cut the size I envisioned. This is what it looked like when the paper was removed from the texture fade....even better than I imagined. I got out the Gold Alcohol Ink and a Blending Tool with felt on the pad. Little by little I added the gold over the entire card. Another layer of Alcohol ink in Slate to add more depth. I had a few ideas on how to use just this piece so I may have to revisit this again in the future. Now back to the watercolor paper - I flipped it over onto the Craft Sheet and added a nice coating of Multi Medium over the back of the heavy card. I brushed the glue towards the center of the leaf so the Multi Medium did not get under the cut shape (remember to work quick!). Then added it to the Alcohol Inked leaf. Press down so that all the leaf pieces stay put. As you can see the watercolor paper is just shy of the base piece...just what I wanted, a really nice gold border going all the way around the card front. Next up, the sewing machine. I ran a long double stitch around the card front with brown thread. Once it was stitched in place, I went around the card with my fingernail pulling up the small edge on the outside of the stitching...lifting, bending, and sometimes even tearing the thick watercolor paper. If a little too much white began to show I just added a bit of Distress Ink to the edge. I cut a brown Core'dinations Kraft Core base for my card front and used a tape runner to adhere the leaf to the cardstock. I also used a craft knife to cut a small slit into the folded edge for some Jute String. 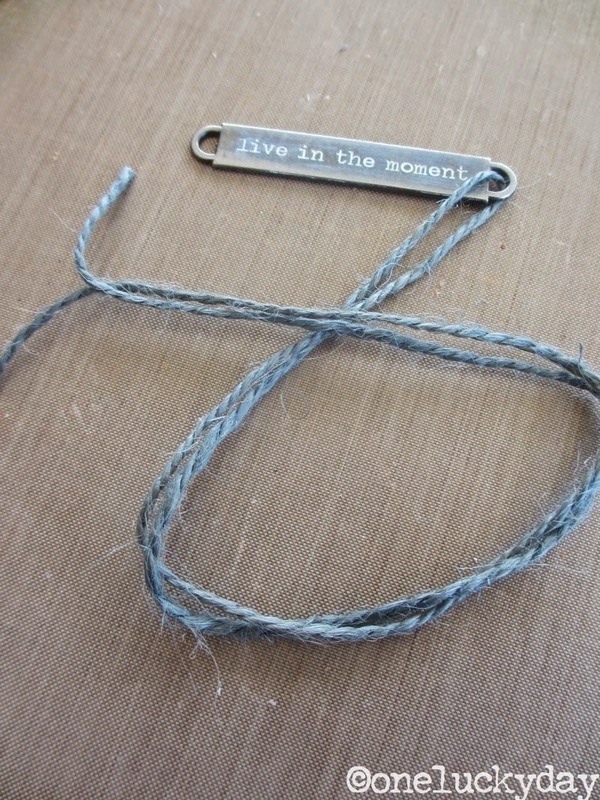 Thread 24" of Jute String into the right side of a Word Band. Pull through till the ends are even. 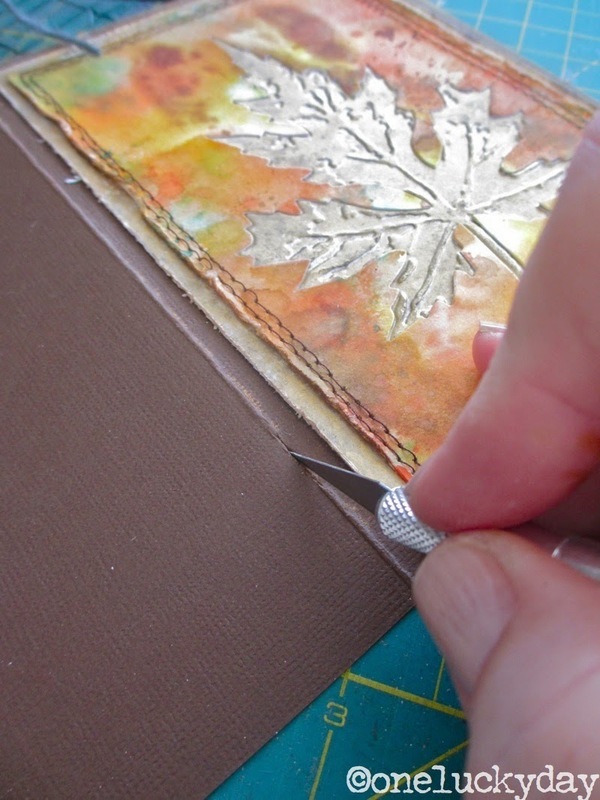 Then wrap around the card front, pulling the two cut ends through the slit in the side of the card. Tie through the left side of the Word Band. Absolutely L.O.V.E. this Layered Leaf die/texture fade! I realize the expectation is that the leaf would have all the mottled color, but in this case the gold is a great foil to the bold color of the stains. It is hard to see how wonderful that gold Alcohol Ink looks in a photo though! I know I will be trying out this same technique with the Layered Butterfly as soon as possible! Loving everything about this quick card since it looks like it took way longer than it did. I'm also looking forward to next week when I have some time to tackle the leaf I didn't use today. The Layered Leaf die just moved to the top of my favorites list! Hope everyone has a great weekend and that it involves a little bit of crafting and spending time with people you love. 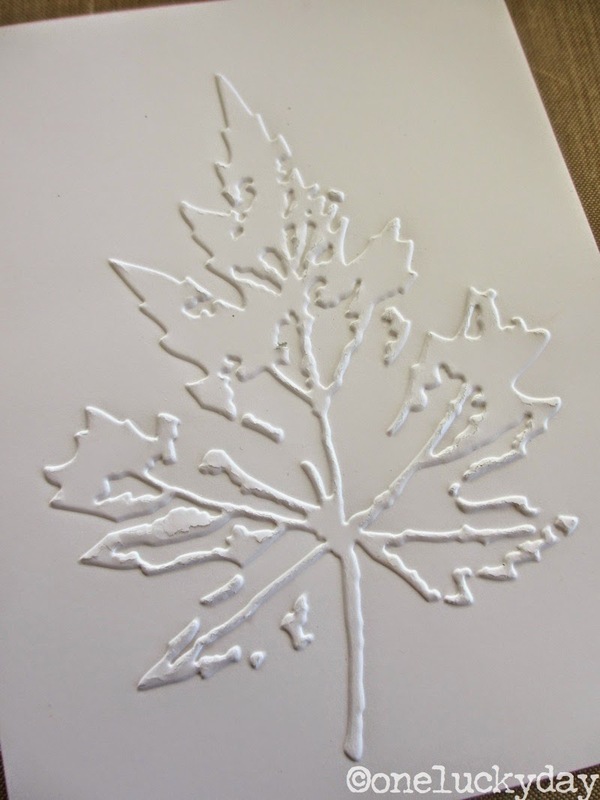 UPDATE: the Layered Leaf die is available NOW at Simon Says Stamp! Maybe because I live in FL and we don't get leaves changing, I am in love with anything that has to do with leaves and changing colors. I actually ohhed out loud at your interpretation of this. So gorgeous. And not that I'm counting, but this is two in a row with no Iced Spruce. I'll be over here, waiting for you to fall off the wagon! The colouring with the gold looks fantastic (great tip too) and I really love the wonderful background too and the stitching around the edges - the little zig zaggy bit is my favourite bit. Simply beautiful! Thanks for sharing Paula! So wonderful ... what an awesome use of "negative" ... WOW ... so creative... why have I never thought of that ! I love Fall and I love this "simple" (for you!) card. Just wish I had that leaf die to start making one just like yours. As I have said before: I don't know how you do it! I just got mine the other day but haven't had a chance to play with it. 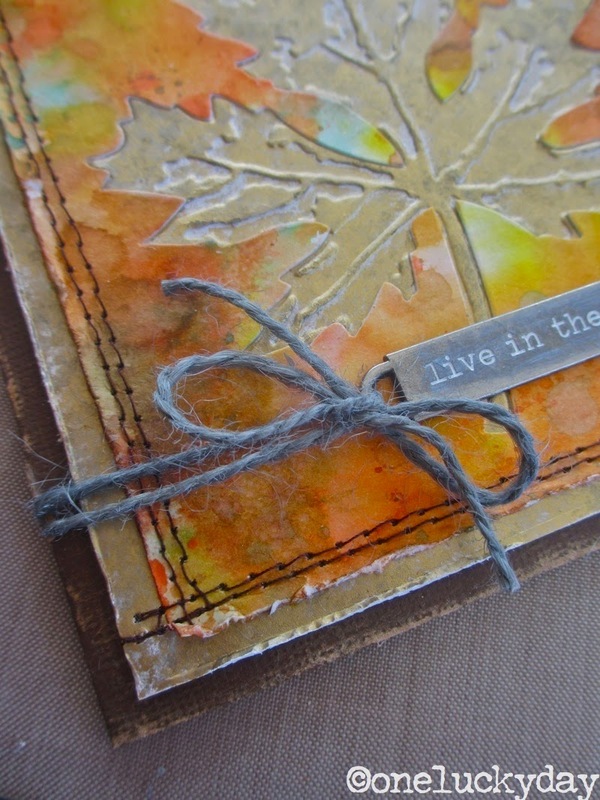 Love the idea of using the 2 two layers and different mediums like you did! Have to say, Fall is my favorite time of year! I love what you did with the project. 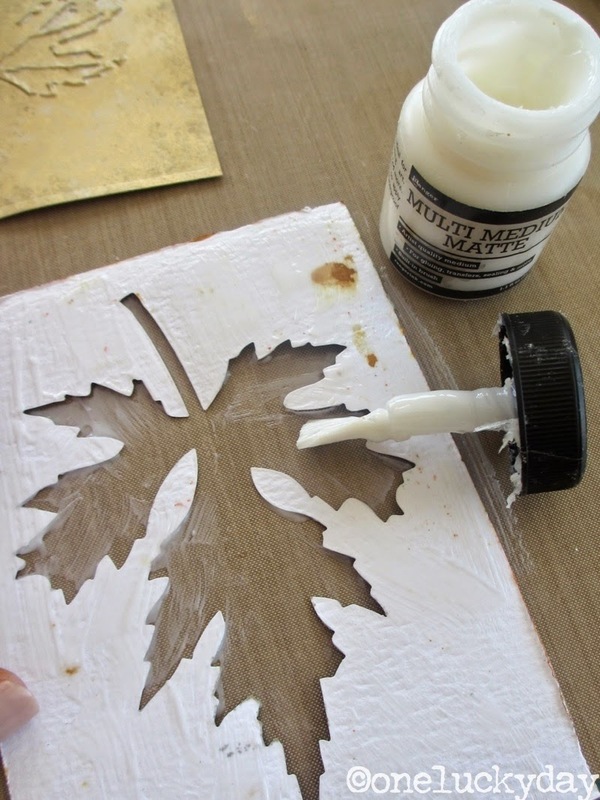 What a fab idea with the molding paste. Brilliant. Thanks for sharing. OMG! Love this! You always come up with such amazing ideas! Spectacular, it truly looks like fall! Just beautiful!! 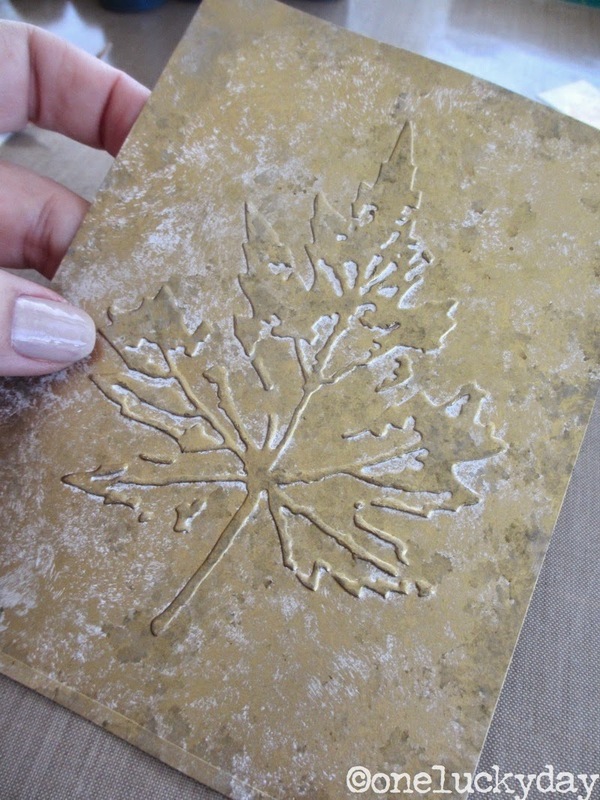 Crazy for the gold alcohol ink on the embossed leaf. I'm looking at these die/texture fade combos in a whole new light. Thanks for the inspiration. SO beautiful-it really made me feel like I was back in New England instead of melting in Fl. Very cool! Thanks for the instructions and photos (for the visual learners). Love that alcohol ink on the specialty stamping paper! Great card. Thanks for all your know how! Fabulous! I think the butterfly & the bee would be great. Oh, I just got an idea - TFS! The colors on this are GORGEOUS!!! Love it. Great process- wonderful result! How fun!! Thanks for the inspiration. What a wonderful card and I love your techniques. As I looked at each step of the process, I thought this would make a wonderful birthday card for my brother who is missing all the color of New England! Thanks so much Paula!! Fabulous! This is so beautiful. Lovely card, I like the technique and the new stamp. GORGEOUS Paula !! What a wonderful idea ! Hello Autumn!!! 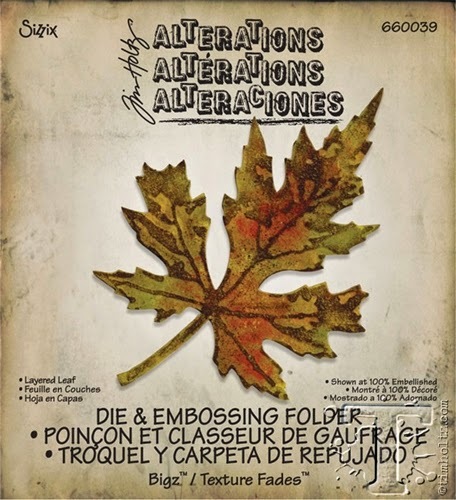 This leaf card is fabulous! You achieved the most wonderful color! I love the technique that you used combining both a text. fade and a matching die, genius! I see a lot of this going on in my studio!!! Beautiful colors and I can imagine how rich the gold must have looked. Pretty! The colors are gorgeous! Don't know why I don't have this die/folder yet ... Would've been at the top of my list! Gonna get it now tho, for sure! So stunning! I was at The Crafty Scrapper yesterday and Caroline said you are coming in October! I am hoping I can take your class. Fingers crossed! What an amazing card! Fabulous tutorial Paula! I love the metallic look of the leaf - just gorgeous! Such a pretty fall card. Love the way you used the negative space for the card with a different background. Thanks for sharing with us. That is a gorgeous card! Thanks for taking the time to show the entire creative process.